This reusable and compostable food wrap will allow you to say goodbye to plastic wrap and hello to fresher food and less waste. 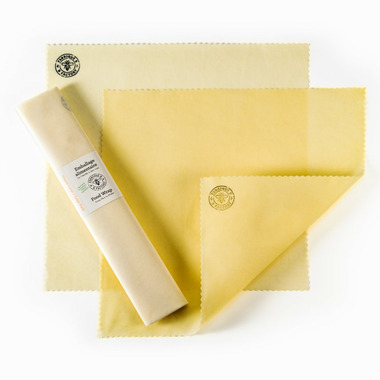 The blend of beeswax, tree resin and jojoba oil creates a long-lasting wrap that will cover a dish, as well as wrap fruits and vegetables, cheeses, breads, sandwiches and more. Once you start using them, you'll wonder what you did without them! For Care: Rinse with cold water, using a sponge or cloth to wipe. Can use a mild unscented dish soap if needed.